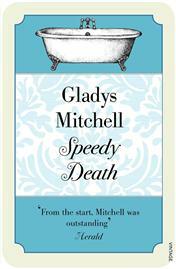 This is Gladys Mitchell’s first book and it marks the entrance of the inimitable Mrs Beatrice Adela Lestrange Bradley, psychoanalyst and unorthodox amateur sleuth, into the world of detective fiction. But instead of leading the police to the murderer, she begins as their chief suspect. My review: I have developed a hankering for classic crime. This is nothing new. I have been a lover of Agatha Christie ever since I read my first one, only a mere five years ago. So I thought who else wrote in this classic age of detective fiction. One of the first names recommended to me was that of the Great Gladys Mitchell. So what does one do in that situation, seek out the first book! Upon encountering Beatrice Adela Lestrange Bradley I was immediately transfixed. What a heroine, although I’m sure she’d abhor the name, sparky, sharp, of an unknown age although one thinks with a grown up son somewhere late-fifties, she is never once referred to in a flattering light in terms of her appearance but she just doesn’t care. Here is a female character who cares nothing for vanity or superficiality, her main interest is the study of human nature and she puts her observations to excellent use. Quirky, charming with a lovely mix of dark and light, this book was completely absorbing. I love Mrs Bradley and look forward with delight to the next book in the series!